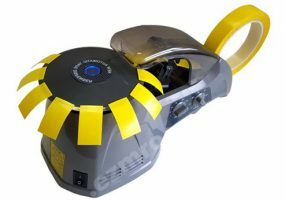 Introducing the New RT-3700 Tape Dispenser is an electronic rotary type tape dispenser. It accepts tape widths of 3mm to 25.0mm wide, lengths of tape are dispensed on the carousel at the pre-programmed length ready to be easily lifted off by the operator. Lengths from 15-70mm can be cut. An extra machine leg can be extended for supporting the machine when processing thick or heavy tapes and this prevents the unit from falling back. Suitable materials that this unit can cut are cellophane tape, masking tape, wool tape, pp tape, double-faced tape, cotton cloth tape and more. If in doubt please send samples of your material for testing at our works. Blades are easily replaced and all types of tape can be quickly loaded.